We get letters every day from satisfied clients of Vacumatic cookware going back over 40 years. Read some of these lovely letters from our happy clients. For the sake of our national economy we must do more about preventing disease. Our health care system is breaking its back on the rising incidence of obesity, cancer and diabetes, all preventable through diet and cookware. Most people and chefs are not aware of the health hazards of the metal oxides entering the food when cooking with inferior cookware. What alarms me is that the pots and pans industry is unregulated, and remains unregulated in spite of the results at the University of California at Berkley that found aluminum in 90% of autopsies of the dead from Alzheimer's disease in 1997. The pubic truthfully needs a third party reference to safe cookware, and I hope our voice will help guide you best to safety. I was unaware that there are 80 kinds of stainless steel until March 2009, when the Salad Master Cookware rep from Niagara Falls visited my Academy in Richmond Hill and enlightened me regarding the 316Ti cookware. Now 316Ti is the only metal that a surgeon can put into our body to repair hip, heart or ears or any part of the body without the body rejecting it. As a baby boomer seeking healthy longevity, I say that surgical stainless steel cookware is the only cookware to buy. Surgical stainless steel makes all vegetables taste so good that children ask for third helpings. It's the best taste because of superior nutrition. I hope many crappy companies and crappy jobs will be lost in this paradigm shift to excellence and wisdom for healthy longevity. In August 2010 I met Ron Geyer of Orleans, Ontario with his Vacuumatic-line cookware. Now I am pleased to know that there is another company that sells top of the line surgical stainless steel. Having bought this Cookware and subsequently five holistic teaching chefs have it, its lifetime guarantee of service for the rest of life of the cookware, not just my life cannot be replaced. But what I didn't like about Salad Master is that the company (based in Texas) wouldn't give our chefs a 50% discount - as they did for the Academy. Subsequently, when Ron approached me with a pot of surgical stainless cookware from Tennessee, what I liked best was that all my referrals can get up to a 61% discount. Go to www.belkraft.com . Investigate it. And say it comes from me when you get it. In my test kitchen, I can say I prefer the lid of the BelKraft, which has a 3-way whistle vent. Very different from the tapping sound of Salad Master®. I can turn a knob and the whistle stops. With Salad Master I either lower the heat or remove from heat so the noise stops. With the whistle blower turned off, I can proceed to simmer soup bones at a low, rolling boil for hours without a noise. Now quiet cooking everybody likes. The truth remains. No cookware can pass the Baking Soda Test except surgical stainless steel. Please do this test to find out for yourself how your cookware contaminates your food. Simply take a teaspoon of baking soda and boil it in a cup of water for five minutes using in any pot you wish to test. Now taste that water. Now you will understand many things, such as you might not be such a bad cook yourself if you had the right cookware. Glass and enamel cookware, iron and all non-surgical stainless steel tastes poisonous because it is poisonous. I am a firm believer in the benefits of cooking in quality surgical stainless steel waterless cookware. 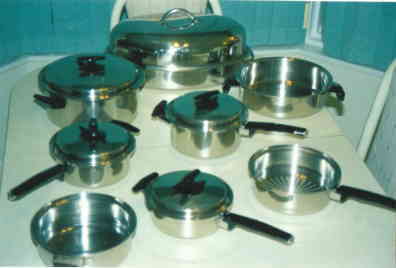 Many features make surgical stainless steel cookware unique and superior to all other metals and surfaces used to cook food. I love the true 7-ply thickness of surgical stainless steel cookware. I can now bake cake on the stove top while saving lots of money by not using the oven. It makes the oven obsolete. I cooked my turkey on the stovetop. Food can cook even in the fridge thanks to that seven-ply protective surface on the top, bottom, and all around the sides. The Vacuumatic method of waterless-cooking takes cooking to a whole new level. The vacuum vapor allows food to cook at much lower temperatures so we chefs can retain 93% of the vitamins and minerals in foods. Now this is truly holistic cooking. The point is vacuum-seal holds the air tight and hot while the pot is off the stove or in the fridge cooking. Just the right temperature is maintained effortlessly inside the pot without destroying color or nutrients because of Vacuumatic seal. It really cuts down heating bills, say UBC studies. And BelKraft is the most equitable investment for everybody. Years ago, the quality of the dutch oven in my cookware probably saved my house from being destroyed by fire. I had left beans on full heat and covered for over 8 hrs on a ceramic cook top. Some smoke eventually did set off the smoke alarm and the fire dept was called but because the pot was so well sealed and had so many layers of metal, the pan was glowing red but no fire erupted. Some white smoke was all we had. The ceramic cook top shattered as it cooled but the firemen said the pot saved the house as the kitchen would have gone up in flames had the fire not been so well contained. This stuff is really high quality! As I indicated, we purchased the cookware in 1965; we had been married for one year. If I remember correctly it cost us around $700.00. We got everything you could get at that time. As far as I'm concerned, it was the best investment we ever made. The cookware is still in good shape and has been used everyday since purchased. The only issue is the handles. Quite honestly the handles lasted for many many years. Probably in the last ten or so have they begun to need to be replaced, and not all of them, but the ones used most often. I highly recommend this product; no matter what the cost. And, I am very happy to see that I can replace the handles. Ron just wanted you to know that my mom received the lids and she is delighted that I was able to find them for her. I have to tell you that her pots are almost 50 years old. She bought them from a salesman who went door to door. They were purchased after she came to Canada and they are still in perfect condition. The handles are only just now being replaced only because of heat exposure on her gas stove. My Cook-O-Matic pots were garbage in comparison! I bought my set while still in high school. My mother thought I was crazy spending 500.00 on cookware and linens. The pan was on the burner when my neighbour called me over to help her with something and I forgot the pan was on my gas stove. I came back 2 hours later and the house was full of black smoke. I crawled under the smoke to the stove and turned it off. There was a big bubble of foaming goo on the pan that looked like a Jiffy Pop bag that was done, but not one drop of this flammable goo had spilled over. Where I live it takes about 40 minutes for a fire truck to reach me. Had I owned any other pan I would have lost everything. I was also thrilled to find out that the pan has a warranty coverage for fire. I’m so grateful I invested in quality back then. It saved my home. This is not a complaint but a letter to let you know that after 40 years, my set of cookware is still just as good as new. Forty years ago, in 1976, I hosted a “dinner” party in Beggs, OK for three additional couples. At the end of the very tasty dinner, all four couples purchased sets cookware and three booked dinner parties. As a result of the successful party, I received additional pieces, including soup pot, bake ware, electric fry pan, and a huge stainless steel bowl. I still use every piece of that cookware today. It has been packed up and traveled to five more addresses. Unfortunately, I do not remember the name of the person who sold us the cookware nor do I have any of the paperwork. I am just letting you know that you sell a quality product. At the time, we thought it was expensive but when you figure it has lasted 40 years and still going strong, it was cheap. The cookware really is amazing. Not only can I notice the increased mineral uptake as I detoxify on the cellular level regularly, but what I noticed in a few days and realize more importantly, is that I can notice an even greater decrease in heavy metals in my system. I have a sensitive system. My mental clarity has really increased hence a lot of great things happening. Energy, sleep. I wasn't looking for this but it happened. Thanks. Received the handles the other day and they were a perfect match, including the screws. I removed the old ones, cleaned it up a bit and now it looks like a brand new pan. I can’t thank you and your team enough for still having these parts available for a pan that’s 43 years old. Not many companies can do what you just did for us. When I was 18 I purchased my Belkraft cookware… which by the way was 32 years ago & it is still the only set I have ever owned. I take good care of it and it still looks as if it's about a year old! I have had my set for 51 years. I also bought 2 sets for each daughter. We absolutely love this cookware and I will pass mine on to the oldest granddaughter. We have a full set of Belkraft stainless steel waterless cook ware that we purchased in late 1971 just prior to our marriage . We have used it almost daily and have been thoroughly pleased, one of the best purchases we ever made . We still use it regularly and it's still in good shape. Thank you very much for helping me with purchasing set of knives and Cookware! I am very pleased with the service you provided, with the price, and your knowledge about the products. The transaction went very smooth and I received my purchase very fast. I would also like to thank you for the help with the registration of the purchased products. I will definitely recommend your site and you, personally, to my friends and family. thank you for the tracking #. and letting me know my pots were on there way. All my beautiful cookwear arrived. I am really loving cooking with them. I am really thrilled. Thank you for helping me decide on what to get. I am very happy with my order. Back in 1975 we were a young couple just starting out trying to live on a buck sargent's pay when this door to door salesman came to our apartment selling pots and pans. My husband invited him in and we listened to his sales pitch. I was furious with my husband when he spent $1000.00 of our savings to buy a set of the surgical steel, stackable cookware! I did at least get to decide if the bottom would be copper or plain. I hate polishing copper so we went with plain. It was a huge set of cookware. It even came with three graduated mixing bowls and cake pans! 36 years later there is not a day that goes by that I am not exceptionally glad that my husband was "suckered into" buying that cookware from a door to door salesman. Over the years people have permanently borrowed some of the set, much to my chagrin, and a few pot handles and lid handles needed to be screwed back on tight but I have loved that cookware since day one. I burned plenty of meals in my day, and one time it was so bad that everyone was sure I would have to throw the pot away. It took a good week of soaking and scrubbing but that pot looks better than a lot of the new pots my kids have. I bet a lot of other cookware manufacturers hated you in the day! Best investment we ever made. I have owned my cookware since I was 18 and love it. It was 1966. I wondered if I could get a catalog to order pieces direct from you. Also I do not have an instruction book so I may never have used it correctly. But it is still wonderful. Thank You for your time. Dear Ron, I was searching the web for Vollrath Vacumatic cookware trying to locate handles for a few of my pots and called the number listed. I want to thank you for your professional help. My parents bought my pots May of 1965 and they are still as nice as the day I first used them. I have owned my vacumatic cookware for 43 years. I have tried varies other cookware over these years (including the fancy Frency stuff) and nothing compares. When I was in law school (nights), I only had the short time between work and school to prepare dinner for myself and my daughter. Happily, I put rice in the pot, chicken on top, and broccoli (or other vegetable) on top: presto, dinner within 30 minutes! When I was first paying for my cookware, my brother even made payments for me when I was unemployed. I was reminded tonight of the great value of this product when I cooked very tender beef/tomato sauce stovetop in less than half the time it might have taken otherwise. Thank you for continuing manufacture of this wonderful product. I've tried to spread the word, but people really don't believe what a wonderful product this it. In 1967 my Mother started monthly payments on what I believe to be a "23 Piece Master Chef Set" (Vacumatic is stamped on the bottom). I got married in December of that year and as part of my wedding gifts she gave me the set -- and the monthly payment book. At the time, it seemed like a lot of money to pay for pots and pans. Over time I've learned what a bargain I got! After 42 years of continual use they still serve us well. I do need one or two repairs to handles and will work on getting those fixed through this site soon. The only piece that I've lost over the years is my smallest saucepan. When my daughter moved away to her own home and was setting up her kitchen she asked if she could have that to take with her. It hurt to let it go, but I did give in. I still miss it! May have to check to see if that one piece can be purchased to make my set complete again. Thanks for a quality product! Ron, I received the pans this afternoon! I am so happy! They are beautiful. I have them all washed up and ready to go. Unfortunately I work evenings so I was unable to use them. I was so excited to get them. Thank you again! They look so similar to what I already have. The handle on the lids have the same look with the exception of being a little higher to accommodate the whistle. I can't wait to try it! I didn't expect them so soon. I am looking for a replacement set for the Vollrath pots and pans which we purchased in the mid 70s and have used extensively since then. The quality and workmanship were exceptional so we would like to find the successors to that line. Any information and pricing which you can provide on the 11 Piece set would be greatly appreciated. My wife purchased a set of Vacumatic pots many years ago. First of all let me say that I thought she was crazy for spending that much for cookware at the time, however after 25 years I realize you really do get what you pay for. I would not hesitate to recommend or purchase more Belkraft products in future. I purchased the set in 1964! I love my waterless cookware and have used it everyday since the pots arrived! Boy, these pans have been great! If I got out the SST polish the pans would look new (except the handles do show wear and are no longer shiny). "Hi Ron: My name is Brenda & I bought your waterless cookware from a door to door salesman in Edmonton Alberta in 1982. At that time I was single & living with room mates who thought that I was crazy to spend that much money on cookware ($1000.00, a lot of money at that time). Today 26 years later I am married & use my cookware regularly. It pretty much looks the same as the day I bought it & works beautifully! I also got a set of crystal as a "gift with purchase" & still have the whole set & use it too! I was pleasantly surprised to find your website & see that BelKraft was still in business, because of the quality of the cookware I have never needed to contact the company so have never looked for you before. I was cleaning out some old files & found the paperwork & decided to see if your company was still around & here you are! I just wanted to let you know that I for one am a happy customer & wouldn't hesitate to recommend your product to friends! I bought my set 35 years ago, and a few years ago I left some potatoes on the stove and forgot them. I smelt the smoke a when I got to the kitchen they were burnt to a crisp. My husband was sleeping so I wanted to put the pot outside before the smoke alarm went off. Without thinking I put the pot down to open the back patio door and the pot melted the carpet and stuck to the bottom. I thought the pot would be done for sure but a friend of mine took it home and sprayed some WD40 on the bottom and inside. The carpet popped off and the three inches thick of burnt potatoes came out in one piece. I was amazed. The pot still looks like it did before and I still use it. Thank-you for your prompt placement of my handle replacement order, I appreciate it. These really are pans that are purchased for a lifetime and warrant the highest recommendation anyone could possibly make. Dear Sirs, I have had your set of Vacumatic pots and pans since about 1967. It really does last a lifetime. The only thing is need is some of the handles and a top rotating piece that allows/restricts venting. I'm so happy to discover you still carry these parts as replacements? I've owned my Vacumatic cookware set for 30 years and have often boasted about having the greatest pots and pans one could find. However, I never dreamt they could conceivably avert a near disaster. One busy Sunday, in a preoccupied moment, I left the house for 1 and ½ hours with something cooking on my gas stove in a Vacumatic 2-quart saucepan. Getting out of my van on my return home, I could hear the smoke detectors going off. In fear, I opened the door expecting flames. Instead, I could see some smoke, and I could certainly smell it. Racing in, I found the contents in the pot burnt to a crisp and smoke rising from it. Except for charred food around the inside and some blackness on the outside bottom, the saucepan itself appeared to be fine. I have no doubt a lesser quality pot would have easily burnt through the bottom, possibly resulting in the handle meeting the flame and who knows what from there. I still can't believe it. Nor can my friends and family when I show them the saucepan. What a lifesaver! First purchased in 1972. I still own it and am totally satisfied. Great product, excellent service and great selection. My fry pan from 35 years ago warped and now that I had a new flat glass type stove top it was spinning. I called BelKraft and was upset that they didn't replace it for free. I thought it was covered under the 50year warranty but the girl said that warping falls under the “ Full Hazard Warranty”. Under this warrantee they only replaced it for half price. The new 7-ply pan seems to be twice as thick and so far so good. I suppose I should just be grateful that they're still around after 35 years. My Wife purchased her Vacumatic Cookware 2/23/1966 and is going into her 43rd. year of cooking with this wonderful cookware. The extra heavy triple thick stainless steel shows no warping or major discoloration. Hi Ron, I was searching the web for Vacumatic Cookware, trying to find replacement short side handles for a couple of my pots. This was when I stumbled onto your site. I never knew to contact BelKraft. I only knew to look for Vacumatic, because it's written under my cookware. I was on my first job after finishing Nursing School when I saw a notice that a salesperson was doing demonstrations on this "waterless" cookware in the dietary department. I decided to see the demonstration and well, needless to say, I was sold. This was my first major purchase. I don't remember exactly how much, but they were quite costly and they threw in a set of China, white with platinun edges. I still have those too. With the exception of a couple of broken side handles, my cookware still looks and cooks like new. My china set is still beautiful also. When my husband and I married, we received another set of "really nice", other name brand cookware from other nurses and doctors I worked with. Not many knew I had spent so much money on this other set. A couple of my friends, also new nurses had said it was really stupid to pay so much money for this cookware. Well, I still have these and the other set has been long gone. I'm still really close to a few of my friends from back then and they can't believe that the entire set still looks like new. I have had this cookware for 40+ years and plan to pass it on to my daughter in maybe another 40 years or so when I'm finished with it. I am truly glad I made such a wise choice so many years ago. Hi! My name is Kelly Cattell. I purchased a set of pots and pans 20 some years ago and have nothing but great comments about the set I purchased. I remember my mom thinking I was crazy because I purchased them when I was 17 years old and I put them in my hope chest. I also chose the set over purchasing a car!! I was married when I was 20 years old and it was so nice to have a good set of pots , they have been absolutely the best. Thank-you. Excellent cookware. 25 years old and I don't think they will ever wear out. Love all the products. Great service, great sales and nice people. My set is 36 years old this august. It is great to be getting such great service after all these years. I bought my first set in '76 for a gift and bought my second set in '92 for ourselves. We really enjoy cooking with them. My set was purchased 37 years ago and has survived 37 years of marriage and 2 kids and many preparations for dinner parties. We're pleased that we still can get service and parts. My first order was made 26 years ago and I have enjoyed using these products. This is my 17th order with no regrets. Good products and good service. My husband bought the Vacumatic cookware in 1967 and took it with him when he divorced his first wife. Boy am I glad I met him so I could get introduced to Vacumatic. Love at first sight. I have finally met a representative from BelKraft. Didn't think the company was still out there. I've enjoyed my products - how they last! Thanks and I'll be a customer for a long time to come. Had my Vacumatic pots for 28 years and still look brand new. Wouldn't cook without them. My wife and I have used the Vacumatic cookware for 38 years and have been very pleased with their performance. Recently we have had to replace a few handles and found the after sales service excellent. Great products and a good company to deal with. I bought my Vacumatic cookware about 31 years ago. It has lasted very well and still looks like the day I bought it. I have had my pots for 25 years now and they are the best investment I have ever made! I have even successfully made the pineapple upside down cake - it was great . Thank goodness I bought my pots and china before I got married - because when I got divorced they were still mine! After using these pots for 39 years they look like new. I would never change them for any other type of cookware because everything turns out well each time I cook. When I bought them at 20, I really couldn't afford the price - but now I couldn't afford to do without them. The best! I bought my cookware in 1975. They still look like new. They clean up really well with little effort. Cooking food in them is great. Bought my cookware 31 years ago. I loved them so much that when it was stolen in a break - in, I bought it again. I also took this opportunity to add to my china. Thanks again. I bought my cookware and china in 1975. I have never bought or used any other products. I love them and I can honestly say I believe in BelKraft and you will too. I'm not yet 50 years old. I was smart to buy them when I was young. I bought my Vacumatic cookware in 1971. They are great. Ron Geyer brought me new handle for my pots and pans today and I told him my story of my eggs. I was cooking two eggs in one of my pots in water. I forgot about them and so the water ran out about a half hour later. I was upstairs getting ready for work (about 7:00 am) when all of a sudden there was a big bang in the house. I ran downstairs and saw that the 2 eggs had literally jumped out of the pot and exploded into smithereens - all over the walls, curtains, stove floor and ceiling. They had literally hit the ceiling side by side. Considering all this, my pot is still in great condition! Yea for BelKraft! I have managed to find your website by searching on Vacumatic . I have a set of cookware my parents bought me in 1967 from a local sales lady that came to your home and performed demonstrations. I have used my cookware almost every day since then and they still look great and still have that "magic" vacuum when the lid is put on right. The only difficulty is that some handles need replacing. I live in Chatham between Windsor and London and would like to know if there is a vendor close by that I could take my cookware to be fixed. My cookware still works great and I don't want to replace them with a new set. Can you help me please? I bought my cookware and china 40 years ago. Looks brand new - just had handles replaced. I began my first full-time job in 1967 and I purchased (I believe 1968) the 23 piece set. I don't remember what I paid, I only remember it was a large sum of money for pots and pans at that time. I have been cooking in these pots for 37 years and they look as good as the day I bought them. (I'm attaching a couple of pics). I am thrilled to find your website to be able to get a new handle. Your product is supreme. Back in 1968 I tried to convince my girlfriend to buy the same set but she said she couldn't afford it. Well, at least six sets of pots and pans later she said she wished she had taken my advice! I look forward to hearing from you about the handle and thank you for your time. When my daughter was 2 (in 1964), a door-to-door salesman rang my doorbell, and pitched your cookware set. From looking at your website, I believe it was either a 19- or 23-piece set. If I bought the cookware, a set of china, service for 8, was thrown in for free. And if I bought the completer set (platters, gravy dishes, sugar/creamer, etc. ), matching stainless steel flatware and crystal (both service for 8) was thrown in for free. To make a long story short, I think I paid $23.85 a month for quite a while. My daughter now has the china. The crystal pretty much got broken. The flatware is missing many pieces. But that cookware has lasted all this time, and is only a bit scratched, but I only had one needed repair - the handle on the lid to the dutch oven came off and my brother-in-law had to fix it for me (this was within the last couple of years). It still cleans up remarkably well with a little Scotch-Brite on the inside and bottom, and I clean the shiny outside with a past of flour and vinegar and buff to a bright shine. Needless to say, I have never regretted my purchase! You guys make a terrific product, and I expect my daughter to use it for over 40 years after she gets it, which I hope will be many years from now. I purchased my Vacumatic cookware forty years ago in Kansas City MO right after I graduated from TWA flight attendant school. The gentleman who sold the set to me said that it was guaranteed for life. I noted on your web site that you are still in business and selling pots and pans that look just like mine. I would be most amazed and delighted if you would honor the promise that the handsome young gentleman salesman made some forty years ago and replace my small frying pan. In 1968 I purchased my ‘ first ' set of Vacumatic cookware, the19 piece set. That was also the year that I purchased my ‘ last ' set of cookware. The very large salesman that I purchased from stood on the pans to prove their endurance. 39 years, 1 husband and 3 kids later I still use that same Vacumatic cookware everyday. Because the years have taken their toll on some of the handles, I was delighted to discover that I could still replace the handles. As a young secretary in the sixties, the initial investment seemed enormous. Almost 4 decades later I appreciate the value of quality and am delighted that BelKraft not only ‘stand' on their products, they also ‘stand by' their products. We are still using the set of pans my wife bought when we were first married almost 39 years ago. We need to purchase new handles for the 8 Quart pan. We cannot believe how these pans have held up over the years. They are the best. We have been using your pans for over 30 years. They are in excellent shape. When my wife was doing the dishes and while I was behind my computer I ‘Googled' your company name. All is well in our Belkraft product home. Buying my waterless cookware from Belkraft International nearly 32 years ago was one of the smartest investments I have ever made. Growing up, I was always surrounded by the wonderful aroma of freshly baked bread, steaming robust stews and soups along with many other wonderful gastronomical memories that my mother so lovingly did day after day. A friend of mine became a salesman for Belkraft International when I was 18 years old. I invited him over to let him practice his sales pitch so he could brush-up on his marketing skills. It was not my intention to make any such purchase for I was still just a teenager but the product sold it self to my mother and I without a blink. The grand package I purchased cost me somewhere around $850.00 CAD and it included 5 saucepans and lids, electric frying pan, double-boiler pot, steamer and masher along with the 3 and 6 egg poacher and tongs. A four piece, 4 setting Pirouette china set was included as a free bonus. In a blink, 32 years of happily cooking with my waterless Vacumatic cookware has past creating some of those same memories for my two grown girls. My own girls are now 20 and 23 years of age and I constantly remind them of the benefits of buying quality cookware. They also like to spend time in the kitchen creating scrumptious dishes to eat. My mother gave me sound advice 32 years ago and I have the same intentions for my girls. "For the first time as far back as I can remember, I cooked on normal stainless steel cookware. I just came back from Orlando to take my boys to see Mickey Mouse. We rented a room with a kitchen to try and save money. (Not easy in Orlando) For the first time I cooked away from home and I am not used to using anything but 7-ply surgical steel cookware. After twenty-nine years of selling quality waterless cookware, I now truly realise what I did for thousands of people when I helped them acquire their sets. Just making breakfast in that warped 1-ply stainless fry pan was a frustrating experience. I had to use butter to make pancakes and they were black on the sides and the middle still needed cooking. I was glad to get home and away from sticking, burning and greasy foods. There are a lot of things you can try to buy cheap, but cookware is definitely not one of them. The only people paying for our cookware are the ones who don't have it. If you would like more info on our sets and how they can pay for themselves in a few short years go HERE or call me.